The craggy hillsides and lower plains as it flows from the northern part of Connecticut. Here wildlife can be seen in and along the river banks and occasionally a proud American Bald Eagle can be seen perched high on a tree top. As you approach the town of Seymour, it is important that you understand Seymour's historical journey. In 1642, Derby was the first inland settlement on the Naugatuck River. From this destination, settlers continued to explore, following the river further north. In the late 1600's a Pequot Indian named Gideon Mauwehu, who lived in the Derby area, gave his son, Joseph, a parcel of land north on the Naugatuck River near the Great Falls. On this land a number of Pequot Indians established their reservation with Joseph as their chief. As the white settlers moved up river into the area of the Falls, they and the Indians worked and lived together as friends. The area began to grow with more and more settlers moving into the hills of Great Hill on the West side of the river, the Skokorat area on the east side of the river and over onto the "Promised land" area. The fertile green land and forest now were spotted with clearings for farms and grazing cattle. Dirt roads were built to connect outlying settlers with the town and the port of Derby. This small settlement, although still part of Derby, now needed a name of its own. In 1738, to honor Chief Joseph Mauwehu, who had been given the nickname of "Chuse", the settlers called the area Chusetown. Mauwehu soon realized the area was becoming too populated for the Indian way of life, and he and his tribesmen left the area to go to Kent where a larger reservation was located. As the population continued to grow, small industries began to appear. A valuable natural resource was provided by the Naugatuck River with its natural falls and numerous brooks and tributaries with small waterfalls on them. These provided water power for such industries as grist mills, corn mills, paper mills and blacksmith shops. When the Revolutionary War began, although no battles were fought in this area, the people of Chusetown were proud to enlist and support more than 100 soldiers from this village. Soon after the War, General David Humphreys became an important figure in Seymour history. David Humphreys and General George Washington remained very close friends following the War, and when Washington became President, he appointed Humphreys to be the first ambassador to Spain and Portugal. While Humphreys were there, he discovered the Merino breed of sheep. This type of sheep has dark wool and when spun gave a superior quality cloth. In 1802, Humphreys shipped the first 100 Merino sheep to the United Stated and after arriving at the port of Derby, they were taken to graze on the hillsides of Chusetown. Humphreys had always been interested in manufacturing and during his visits to England and France he studied their industrial systems carefully. In 1803, he purchased a large piece of property at the Falls area on the Naugatuck River in Chusetown where other little mills had been operating. Here he built one of the finest woolen mills in the country. He used the knowledge he had gained in Europe and our town quickly acquired a national reputation as a producer of unparalleled woolen cloth. Cloth for Presidents Thomas Jefferson and James Madison inaugural uniforms was manufactured here. In 1804 the name of the area was again changed from Chusetown to Humphreysville, in honor of David Humphreys and all that he was doing for the town and her people. The village of Humphreysville prospered, attracting other manufacturing concerns. Items such as cotton cloth, paper, furniture and tools were now being produced here. New one-room schoolhouses were built, church congregations moved into larger structure and by 1849 not only did the railroad enter the village, but the Humphreysville Academy, the areas first opportunity for higher education opened in Seymour. Although by 1850 Humphreysville was still a part of Derby, the people in this now bustling and prosperous village felt a need to separate from Derby and become their own community. Mr. Leman Chatfield went to Hartford to petition for separation. It is not clear why, but the petition sought to have the town named "Richmond" and a bill was written with that name on it. Thomas H. Seymour was then Governor of the state of Connecticut and it was said that if the people chose to name the new town "Seymour" in honor of the Governor, the bill would meet with immediate acceptance. 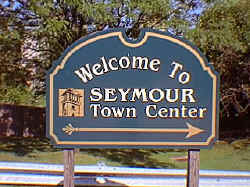 It was done and the town of Seymour officially became incorporated during the May 1850 session of the General Assembly. Seymour held their first town meeting on June 24, 1850 and Leman Chatfield, Daniel Holbrook and Thomas Cochran were elected Selectmen. The population at the time was 1,677. With this new town came many possibilities for the area to grow and for the people to prosper. The railroad provided factories with an easy and in expensive means of transporting merchandise. New industries began to open and the name of Seymour was becoming known worldwide. Austin Goodyear Day started an industry that produced telegraph cable that could be placed under the ocean so that clear communications from one continent to another was possible. Today this company, now called the Kerite Company, is still in business on Day Street. The H.P.& E. Day Company had its beginnings producing hardened rubber fountain pens and pencils in 1865. Here was the invention of the first practical fountain pen. A number of years later this company became known as the Waterman Pen Company and produced one of the finest fountain pens (and ink) in the world. Today this company still produces one of the finest fountain pens and is headquartered in France. The New Haven Copper Company that began operations in 1848 as the Humphreysville Copper Company, still stands on the banks of the Naugatuck River. Thomas James, who came from Wales as a young man, took a job with this company and was responsible for the invention of polished copper . In the paper mill industry, Seymour's mills were the first in Connecticut to use inexpensive straw to make paper for newspapers, books and magazines worldwide. Brass, copper wire for telephone and telegraphs and German silver for tableware were also produced in Seymour. Before the end of the nineteenth century, industries in Seymour were producing everything from bottled spring water and ginger ale to car springs.